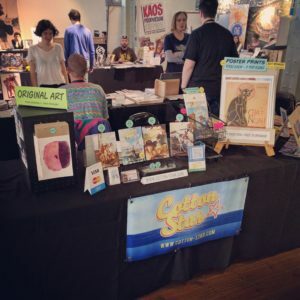 Open Book Comics Fest was great! While not the most lucrative event, we really enjoyed the vibe and vendors. The crowd was also interesting and friendly. We saw a bunch of new faces and there was some amazing work on show. The turnout was quite good and we look forward to being involved again next year! Our little booth all set up! As you guys have no doubt noticed, we’re lagging behind on pages again. Ben has some hectic deadlines at the moment, both for his day job as well as freelance work, and my hand is still in a lot of pain from the injection. The surgeon said to give it another week, and if things don’t improve, we need to do some neural testing in to see exactly where the problem lies, and the next step would be surgery. Things are a little crazy work wise, and if we’re going to save up for hand surgery and pay our bills, we can’t say no to freelance work, especially for our long-standing return clients. Thus, until further notice, our update schedule is just “when we can.” We will of course still push hard to put up a page once a week, but Ben’s workload is just too intense at the moment. With my hand having caved in, we need to be extra careful not to let the same happen to his, or we are royally screwed for income. We appreciate your patience and continued support, and apologise that we can’t work any faster for you guys. I am friend of Wynand Lens, I work in the animation department at Jincom and they are looking for a freelance Illustrator, for Strika style comics but more towards the Health and Safety campaign stuff. Are you interested or do you know anyone that would be?